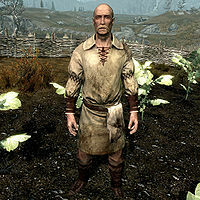 Lemkil is a Nord farmer working hard to make a living in the small farming community of Rorikstead. He is the widowed father of twin daughters, Sissel and Britte, and has passed his bitterness on to his children. Despite his unhealthy attitude, he will pay you for harvested cabbages, leeks, and potatoes. He sleeps in his farmhouse every night between 10pm and 6am. After waking up he ignores his children and goes straight to work in the field behind his house, for twelve solid hours. At 6pm he enters Frostfruit Inn for some dinner and relaxation before he returns home and goes to bed at 10pm. He wears a set of barkeep clothes with a pair of shoes, and carries a belted tunic, the farmhouse key, an iron dagger, and an assortment of common items and gold. He is obviously angry and will immediately advise you, "Do yourself a favor and don't have children. They're good for nothing at all." and follow it up with, "I got enough troubles, so don't go adding to them." He will then start to speak about his twin daughters and reveal the real reason behind his bitterness: "I spend every day tending the fields, and what do my daughters do? Nothing! Complain and caterwaul! Sleep and eat! Useless!" and "Curse my good-for-nothing daughters! My wife was twice the woman they'll ever grow to be. She gave her life birthing them. What a waste." Jouane: "Good day, Lemkil. I saw some nice dresses for your little girls while I was in Whiterun. I'd be happy to purchase them, if you like." Lemkil: "We don't need your charity, Breton. If my girls deserve something nice, it'll be their father who buys it." Rorik: "Those little girls of yours are growing like weeds, Lemkil." Lemkil: "Yes, and just like weeds, they're nothin' but trouble." This page was last modified on 30 December 2017, at 04:19.